Different beer styles will call for different levels of minerals to achieve the flavour profile we are targeting. By adjusting the amounts of specific minerals found in your brewing water, beer can be made to taste fuller bodied, sweeter, drier, more bitter, or even sour. Calcium (Ca): Essentially flavour neutral. Promotes clarity and flavour stability of the final beer. Affects enzymatic activity in the mash, protein coagulation during the boil and benefits yeast health. Typical brewing range is 50-150 ppm. Magnesium (Mg): Adds a sour, astringent flavour. An important yeast nutrient, required at a level of least 5 ppm. Levels above 125 ppm have a laxative effect (fun times).Typical brewing range is 5-40 ppm. Sodium (Na): Rounds out flavours and accentuates sweetness. Lower concentration tends to produce a cleaner flavour. May taste salty above 150 ppm and harsh/sour above 250 ppm. Typical brewing range is 0-50 ppm. Adding these minerals to our brewing water is unfortunately not as simple as buying a bottle of each and adding a pinch of this and a dash of that. Through the wonders of nature (we promised no chemistry here!) many of these minerals cannot safely exist on their own, in a stable form. Pure Sodium (Na), for example, is a toxic metal that explodes if it comes in contact with water which would make for a very bad brew day. But combine Sodium (Na) with Chloride (Cl) and we create a stable salt, in this case regular table salt (NaCl). So when we add minerals to our water, we're usually forced to do so two at a time using readily available and stable salts. Adding salts also happens to affect pH, but more on that later. Gypsum / Calcium Sulphate (CaSO4): Adds Ca and SO4, lowers pH. Calcium Chloride (CaCl2): Adds Ca and Cl, lowers pH. Pure Epsom Salt / Magnesium sulphate (MgSO4), unscented: Adds Mg and SO4, lowers pH (very slightly). Chalk / Calcium Carbonate (CaCO3): Adds Ca, raises pH. Baking Soda (NaHCO3): Adds Na, raises pH. Non-Iodized salt (NaCl), also known as: Pickling salt / Kosher salt / Cheese salt: Adds Na and Cl, raises pH. Out of these six salts, the first three are the ones we use the most. We will sometimes use chalk with dark beers where we want to increase Ca without affecting other minerals. We have yet to use baking soda or non-iodized salt after many years of brewing. 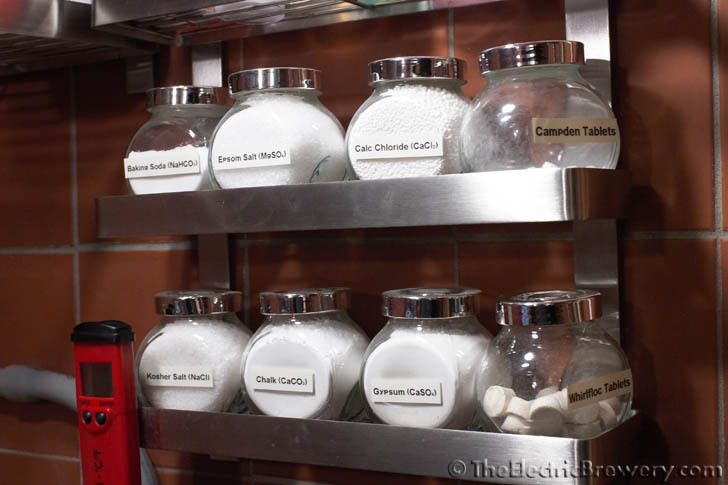 We keep our brewing salts in sealed spice jars that sit on a wall mounted stainless steel spice rack. Labels are added using an inexpensive Dymo LetraTag Plus personal label maker. Before you can pick a flavour profile, you have to have a beer recipe or style in mind. For this guide, let's use the Blonde Ale we feature in our Brew Day: Step by Step guide as the target style and show how to adjust water to suite this beer. 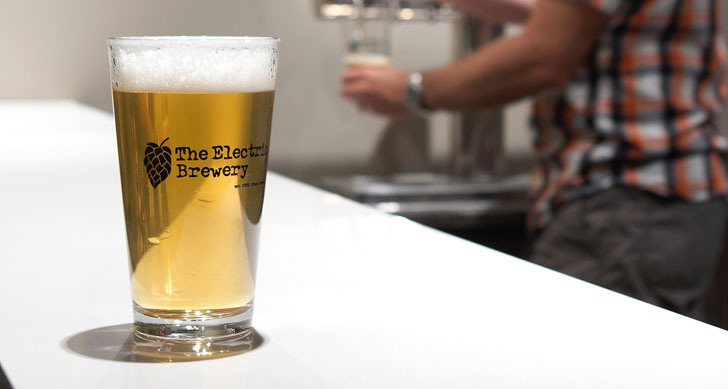 Our Blonde Ale is a lighter bodied, balanced beer. It is neither malty nor hoppy so we won't be looking to accentuate any specific flavours. Our Blonde Ale. A balanced, lighter bodied beer. With our Blonde Ale we are interested in keeping Calcium (Ca) and Magnesium (Mg) fairly low and hitting the minimums (the values of which are a highly debated topic) in order to keep the yeast and enzyme reactions happy. Both Chloride (Cl) and Sulphate (SO4) we want to keep reasonably low and close to balanced. As mentioned above, high Sulphate may enhance bitterness/dryness while high Chloride may enhance flavour or maltiness. We're not looking for either of those attributes here given that the beer is to be lighter bodied and quaffable. For most beers we want to keep Sodium (Na) low as it tends to produce a cleaner flavour and that's certainly the target for this beer style. Description: Hit minimums on Ca and Mg, keep the Cl:SO4 ratio low and equal. Do not favour flavour/maltiness or bitterness/dryness. For balanced beers. Description: High SO4 with restrained Cl which helps accentuate hop bitterness/dryness. For hoppy American styles. Description: Increased Cl with restrained SO4 which helps accentuate flavour over bitterness/dryness. The hop bitterness is smoother, less sharp, less dry than our 'Hoppy' profile. Helps support a silky smooth and rich mouthfeel. For hoppy New England style ales. Description: Similar to the 'Hoppy' profile but with less Sulphate in order to go easy on accentuating bitterness/dryness. Used in some English styles. Description: Just enough to acidify the mash while keeping the water soft. Note: Our Magnesium targets tend to be on the low side as it occurs naturally in grain, so the actual amounts will always be higher than what you target. Take a look at our recipes for more examples as we always include target water profiles with a short explanation. Keep in mind that these numbers are not absolutes. Don't get hung up on accuracy or be concerned if you are not able to exactly hit our recommended targets. A 10% change (or possibly more) in any number is probably not going to be noticed in the finished product. Water can be adjusted to suite a particular brewer's tastes or needs just like any other brewing ingredient so feel free to experiment as well. How salts are used and adjusted in brewing is also constantly evolving. For example, it's been common practice in American IPAs to keep the Sulphate (SO4) level considerably high relative to Chloride (Cl) in order to enhance the bitterness/dryness of the hops as is done in our 'Hoppy' profile. Over the last few years a 'New England' style of IPA has emerged where the opposite is done to promote a smoother, less sharp, less dry bitterness. Shouldn't I try and target certain historical profiles from famous brewing cities? We don't recommend this approach. Some will tell you that it's best to adjust your water to match that of a classic brewing city or region. For example, trying to match the extremely hard (full of minerals) water found at Burton on Trent to brew an English beer. We find that approach backwards as it doesn't account for what the historic brewers may have done to the water to make it suitable for brewing their specific styles of beer (such as using slaked lime or boiling to reduce hardness). Water is only one ingredient, it doesn't tell the whole story. It needs to be taken in context with everything else that goes into making the beer. We recommend building your profiles based on the flavour outcome that is desired, not because historical brewers may have been forced to use specific water compositions.